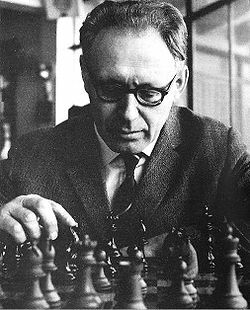 Mikhail Botvinnik is one such player in chess history whose memories can't be erased. And his match against one of the legendary chess player named Lajos Portisch which had tricks and best moves is one of the games that should never be forgotten. The game is as follows in which Botvinnik had White and Portisch had Black. These are just formal moves which only involve the pawns heading to the front. Now the knights are at the front and Black has taken an upper hand over White. The game proceeds as expected and edges towards some twisty moves. White takes a safety move to make his King more safe. Now Black is also in a secure position which makes the game even tougher. The White queen now gains control over the central position. 13.Rfc1 Re8 14.Rc2 Bf8 15.Rac1 Nb8? White enhances its strength in all views of attacking Black. proceeds the game well to have an excellent finish. 17.R1xc6 bxc6 18.Rxf7! h6 19.Rb7 Qc8 20.Qc4+ Kh8 21.Nh4! Qxb7 22.Ng6+ Kh7 23.Be4 Bd6 24.Nxe5+ g6 25.Bxg6+ Kg7 26.Bxh6+! Play through the moves of this fantastic game here. Join in and write your own page! It's easy to do. How? Simply click here to return to Famous Chess Games.